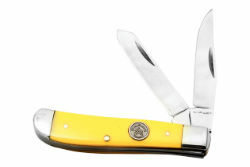 This 3.5" classic trapper knife features a yellow Delrin handle accented with a SARGE medallion and nickel silver bolsters. Traditional 2.75" clip point and spey blades are fashioned from 440C stainless steel and separated with brass liners. If you need a functional utility knife that fits in your pocket and looks great, the Trapper is for you!